Before today’s big Olympic victory, the US Women’s Gymnastics Team already won their media gold medal by landing on the cover of Sports Illustrated (SI) . Does this represent a new SI era after a well-celebrated 40th anniversary of Title IX or merely SI’s yearly one-and-done women’s cover quota? Under Terry McDonell — current Sports Illustrated Group boss — SI’s depiction of women has never been worse. SI is a prime case study in the Title IX paradox: The 1972 legislation has helped bring sports participation of women to historic highs, but related sports media coverage has dropped to all-time lows. Criticism of SI and women is not new: A 2012 study, “Where are The Female Athletes in Sports Illustrated?” updates a 30-year chorus of studies from 1979, 1988, 1991, 1994, 1996, 1997, 2002, 2003, 2008, 2009, 2010, videos , and you get the point. According to must-see documentary “Not Just A Game” and TV studies, ESPN The Mag and Sports Center are not much better. Sports Illustrated’s newest low can be traced directly to McDonell’s 2002 arrival as SI’s Editor in Chief. He arrived with much-needed tech-savvy, but also an editorial history dominated by Men’s magazines. His previous two stops at the tabloid US Weekly and Men’s Journal would noticeably influence SI’s direction. Last year, The Atlantic’s Eleanor Barkhorn kindly treated readers with the nine ways a woman could land an SI cover. In this year’s remix, her special spirit is applied to McDonnell’s 10-year tenure. Under the new rules, breaking the cover barrier is less about “what you play” than “who you are”. The Problem: Skin trumps skill. ”Bikinis or Nothing” isn’t just a swimsuit cover slogan, it’s a cover policy. With this month’s Olympic Cover, the score is now tied. Since 2002, ten covers have been devoted to swimsuits models, and ten depicted as actual athletes (*excludes shared covers or “commemorative” issues not mailed to subscribers). Before McDonell: SI was heavily criticized in the 1990’s, but still had more than twice as many (non-swimsuit) covers of women. With just the slightest reinvestment of swimsuit profits back into women’s sports, SI could easily exceed its 1950′s average of five covers per year. The Problem: Country even trumps champion. While last year’s “one and done” solo cover went to USA Soccer goalie Hope Solo, The Japanese Women’s World Cup Champions and heroics of Homare Sawa were “Do You Believe in Miracles?” material. With their supreme underdog status, incredible grace, and context of Japan’s devastating earthquake and tsunami, they also should have been SI’s 2011 easy choice for “Sports Person(s) of the Year”. But they were just sooooooooo – Japanese. Before McDonell: Roberto Duran (7), Bjorn Borg (5), and Steffi Graf (3) all received multiple covers for their brilliance. Big Picture: Unless wearing an American uniform, SI doesn’t care much for foreigners anymore – women or men. The greatest victim has been Roger Federer whose legendary tennis career produced one solo cover and several Sportsperson of Year snubs. Boxing sensation Manny Pacquiao? : Nothing. Same goes for soccer phenoms Lionel Messi and Marta, and the golfing brilliance of Annika Sorenstam and Yani Tseng. The Problem: Hair trumps heart. Long is good, blond is better, flowing is preferred, and bleach is a legal performance enhancer. Rule #3 can trump rule #2 but not rule #4. At least Maria Sharapova won a Grand Slam title unlike previous Russian cover tennis princess Anna Kournikova whose 2000 cover predated McDonnell. “But Women Can’t Sell!”: In 2004, Sharapova was a top-seller who even doubled single-copy sales of Derek Jeter and Kevin Garnett. Big Picture: Softball great Jennie Finch was covered in a mini-skirt, and skiing sensation Lindsey Vonn’s derriere was bent up high. Unlike the standard tuck position, Vonn is smiling with head cocked sideways, and seems to have forgotten her helmet. Oops. The Problem: White trumps right. In a sports era dominated by African-American women, only Serena Williams has been featured by herself – besides Beyonce. SI ignores women of color today as it once did Black men before 1968 . 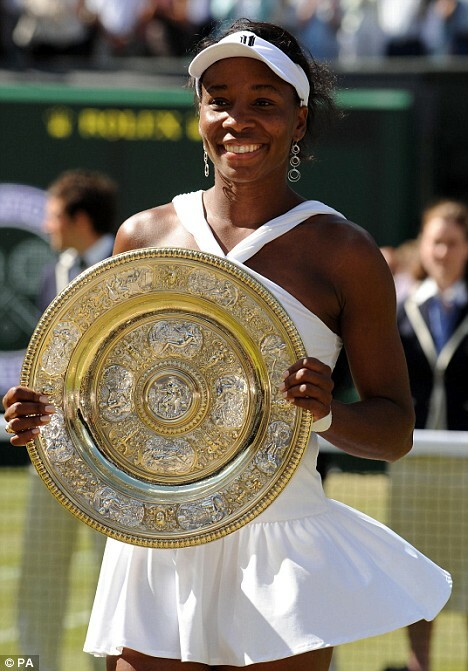 Venus Williams’ seven grand slam titles? : Not grand enough. Venus and Serena on a cover together, or Laila Ali’s fists? : No storylines there. The hoops dominance of Candace Parker and Brittany Griner in college, or Lisa Leslie and Sheryl Swoopes in the WNBA-Olympics? Not dominant enough. Historic women’s hoops win streaks of UCONN (90-games) or Olympics (35 and counting)? Not long enough. Before McDonell: In the previous 10 years, SI featured a young Serena, a young Venus, Michelle Kwan, Marion Jones, Jamila Wideman, the Women’s Olympic Basketball team, Gail Devers, Jackie Joyner-Kersee, and Kristi Yamaguchi. Big Picture: All Serena did to receive a 2003 cover was win four consecutive Grand Slams. After 13 Slam wins, another came in 2010 entitled: “Love Her, Hate Her”. Why would SI “hate her”? : For berating an official? Should John McEnroe burn in hell? Or at least not profit from it? Let’s debate. Just how big is the gender-race compound bias facing women of color? 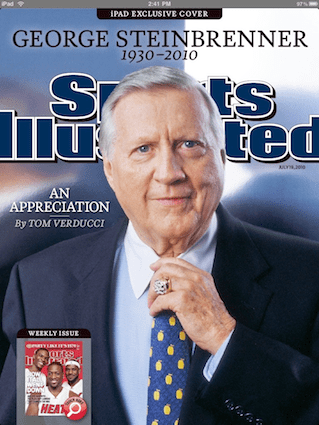 Just one week later, SI issued an IPad cover entitled “An Appreciation“ for George Steinbrenner – a man who turned boorish behavior into an Olympic sport when not collecting two felonies. Why can’t SI just “love” Serena? “White anger is entertaining; Black anger must be contained”. The Problem: America’s best two female athletes the last two years went coverless. Abby Wambach doesn’t quite fit SI’s definition of “feminine enough”, Brittney Griner definitely doesn’t, and both violate previous rules. Before McDonell: SI’s Sexist-Heterosexist-Eurocentric femininity box is not new, and past rule-breaking sports legends like Martina Navratilova and Jackie-Joyner Kersee did not get the attention they warranted — but they still received three covers each from SI. RULE #6: GET A MAN! The Problem: Diana Taurasi and Maya Moore each led the UConn Huskies to multiple championships, but can’t land a regular edition cover without male validation. Pat Summitt too! Shared covers would be a great thing if they served as additions and not replacements for solo covers (commemorative issues don’t count). “But Women Can’t Sell!”: The 2003 and 2008 shared college basketball previews (CBP) both had great success, and the 2003 Taurasi-Okafor cover was clearly the highest seller of nine CBP issues studied. RULE #7: BEAT A MAN! The Problem: Danica Patrick is the only woman to land more than one positive SI solo cover under McDonnell, but competing against men is not the easiest path to emulate. “But Women Can’t Sell!”: Patrick’s 2005 cover outsold the previous seven issues including Tiger Woods, Steve Nash, Randy Moss, Shaq, the NFL Draft, and every single baseball and basketball issue that year (non-previews). Big Picture: If Tim Tebow can receive six college covers without having to compete against the very best men in his sport (i.e. NFL), women should not have to either. RULE #8: GO FOR THE GOLD! The Problem: With this month’s Olympic cover preview, Rule #8 has just been cautiously reinstated. In 2008, SI completely ignored women for the first Olympic year in SI’s history despite dominance by US Olympic hoop team, gymnast Shawn Johnson, and swimmer Natalie Coughlin. SI is not alone. “But Women Can’t Sell!”: Sales of the 2004 Women’s Olympic team not only edged out Michael Phelps from previous week, but also outpaced 2004 covers by men named Brady, Vick, Clemens, Griffey, Kobe, Armstrong, and Mickelson. RULE #9: STRIP FOR SI! The Problem: The significant majority of woman athletes with solo covers have also posed for swimsuit pictures within its pages. While each athlete certainly has that right, a disturbing pattern has emerged: Williams, Finch, Patrick, and Vonn were all rewarded covers within a few months after posing for the swimsuit issue. Before McDonell: In different decades, Marion Jones, Michelle Kwan, Florence Griffith Joyner, Chris Evert, and Peggy Fleming all made covers without posing in bikinis for SI. Objectification of women isn’t a swimsuit thing — it’s the only thing. This entry was posted in Sports and tagged Charles Modiano, Crunk Feminist Collective, misogyny, sexism, sport, Sports Illustrated, Women's Sports Foundation. Bookmark the permalink.